Developing a COMMUNICATORS' Global Community! To all participants: Thank You for joining us! Data is everything. People power. New media. Attention span is short. Authenticity and trust. Intense two days, with plenty of practical ideas to take into our work, and innovations to embrace. I came away fascinated by how influential communication is in shaping business, society and culture. We'll build on what we’ve learnt and grow the fantastic relationships we’ve made." "Fantastic, passionate, expert communicators! At a conference people show up in thousands, sit in packed auditoriums, someone preaches at them, they collect free stuff from expos and try to avoid guys determined to sell them things they don’t need. At a forum you share ideas, experiences and shape up the future of the industry: that’s precisely what everyone at this forum went to do! Would I recommend it? Absolutely. All I would say to those considering going in 2015: you need to go with an open mind and willingness to share experience, challenge thinking and actively participate in the debate. I returned home with plenty of ideas for how we will improve client projects in the future!" - PR agencies are trying to turn a bus into an airplane at 50mph: change to new PR model is hard. - True stories (PR) are far more powerful than made-up stories (advertising). - PRs act like Democrats and deal in facts, advertisers act like Republicans and deal in emotions. - Chief 'reputation' officer is to counsel CEO/C-suite/board on implications before decisions are made. - PR today is about turning the critics into your advocates. - Each time you create a practice area in an agency, you destroy value. "This year's edition was absolutely brilliant - keynote speakers of high calibre, interesting discussions and a priceless network opportunity were some of the top features of the Forum. Old friends and new friends altogether in a great atmosphere - that is the real resume of #WCFDavos. The bright minds we meet there become good friends that we do not only exchange professional ideas with, but also happen to meet again in different parts of the world." We ran a business game designed by Lena: in about an hour "consultant" players organized themselves in "agencies" and sold their services to "client" players. It is amazing how in such a short period of time, with no preparation and uneven understanding of the rules, the simulation did take off, people started literally behaving like in real life. The group I was in created a relatively big agency, we aggressively pursued new business and eventually we bought out a smaller agency. After a while, it was clear we were the largest and most aggressive player in the market and the other smaller agencies reacted forming an association and extolling the virtues of niche, specialized players. Fun and exciting! It really got people off their butts and participating, with no exception." From Brazil, UK, Bulgaria, Russia, Switzerland, Ukraine, Italy, Croatia, Mexico, South Africa, Serbia, India, Lithuania, Czech Republic, Belgium, Slovenia, Armenia, Ghana, Hungary, Netherlands, France, Herzegovina, USA, Australia, and Canada. To all our partners - Thank You! Traditionally, the forum hosted an evening ceremony and gala for the annual Communication for Future (C4F) Davos Award, positioned in 6 categories. See who are the happy winners of C4F Davos Awards 2014. "Tolerance for the sake of the Future". 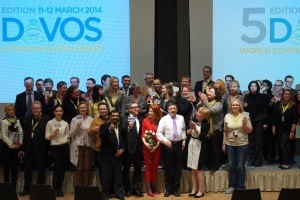 The Fifth edition of WCF in Davos expanded our global community!